On July 4th 1776, the 13 American Colonies declared their independence from the English Crown. One month later, 30,000 Crown Force troops landed in New York, joining forces already stationed there under the command of General Sir William Howe. By spring of 1777, a plan devised by Howe to attack the American capital of Philadelphia had been approved by the English Crown. In July 1777, Howe's army of 15,000 left New York to attack Philadelphia. After nearly six weeks at sea, Howe's army landed near Elkton, MD in late August. By this time, General George Washington and his Continental Army had repositioned to Wilmington, DE to block the main road to Philadelphia. For two weeks, Chester County was the stage of battleground for these two opposing armies, with more than 30,000 Crown Force and American troops maneuvering, marching, camping, plundering, and fighting three battles. On September 11, 1777, Howe's army mounted a two-prong attack that successfully outflanked Washington's troops on the banks of the Brandywine Creek at the Battle of Brandywine. On September 16, the next encounter of the two armies took place at the Battle of the Clouds, which was largely curtailed due to a nor'easter and resulted in General Washington's northwest movement toward Reading Furnace to protect critical iron works and munitions needed for the revolution. September 21 saw the third and final encounter between the two armies in Chester County at the brutal Paoli Massacre, and a day later the Continental Powder Works and Gun Factory at French Creek were destroyed. Howe outmaneuvered Washington's army along the Schuylkill River and captured Philadelphia on September 26. After an October 4 battle at Germantown, Washington and his army spent the winter camped at Valley Forge, while Howe and his army occupied Philadelphia. 2017 marks the 240th anniversary of the Philadelphia Campaign of 1777. Chester County's Town Tours & Village Walks program feature Campaign sites in the area among other regional programs. 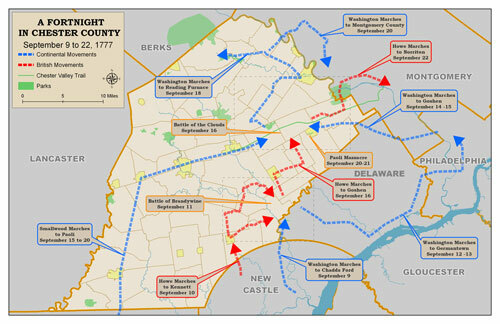 With funding by the American Battlefield Protection Program and in partnership with the Brandywine Battlefield Task Force, the Planning Commission has been undertaking local and regional planning efforts through studies, interactive mapping, and plan documents related to the Campaign of 1777. The Battle of the Brandywine was a critical military encounter of the American Revolution. 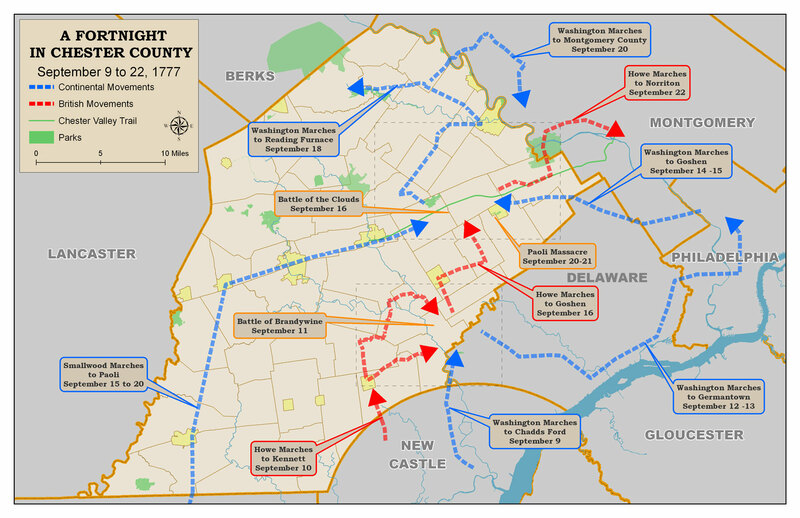 Lands within and leading to this battle, spanning both Chester and Delaware counties, are considered a resource of national significance by Landscapes2 and are designated National Historic Landmark. To plan for the historic resources within the battlefield, it is important to understand how the battle was staged. Learn more. The Battle of the Clouds took place on September 16, 1777 less than a week after the Battle of Brandywine. The two full armies of 26,000 met and engaged briefly before a violent storm pre-empted the battle. Outnumbered and very short on dry munitions, Washington retreated in the night toward Yellow Springs and then continued north to protect Reading Furnace. Learn more. The Battle of Paoli, also called the "Paoli Massacre," was a small, vicious battle that occurred at midnight on September 20-21, 1777 when the Crown Forces led a surprise attack on Brigadier General Anthony Wayne's American encampment. Learn more.